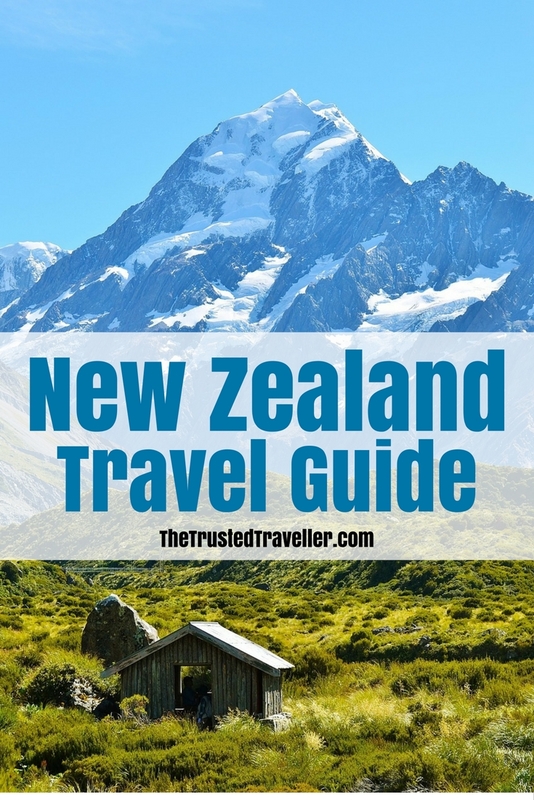 This New Zealand Travel Guide aims to provide you with simple and stress-free travel planning information and inspiration for planning a trip to New Zealand. Currency: $ New Zealand Dollars which is made up of 100 cents. Coins come in 10c, 20c, 50c, $1 and $2 denominations and notes in $5, $10, $20, $50 and $100 denominations. Electricity: 230 volts AC, 50Hz. Plugs with two or three flat pins are standard. Outlets for 110 volts for small appliances can be found in most hotels. 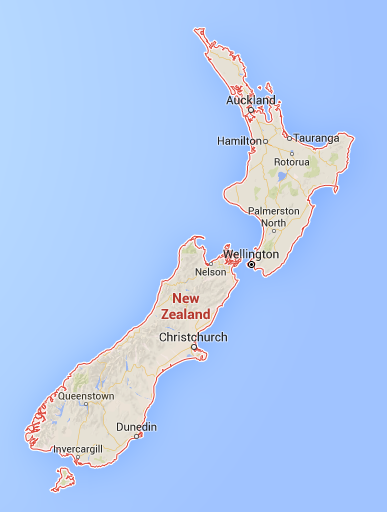 New Zealand is made up of two main islands, the North Island and the South Island. They stretch from north to south and are separated by the Cook Strait. The North Island is more developed and home to the country’s two biggest cities, Wellington in the south and Auckland in the north. The island is mostly rolling green hills and farmland, with the central heartland home to geothermal activity like boiling mud pools, geysers and active volcanoes. The South Island is much more dramatic. Think snow-covered mountains, fjords and glaciers. There are no big cities, rather Christchurch and Dunedin are more like big country towns. Because of the country’s length, it can, at different times of the year, experience a broad range of weather. It is subtropical in the north and more temperate in the south. The north has no extremes of heat or cold, while the in the south, winter can be quite bitterly cold with significant snowfalls in the mountains. The eastern parts of the country often experience drought conditions in summer and the west, particularly in the South Island, is likely to receive more rain. 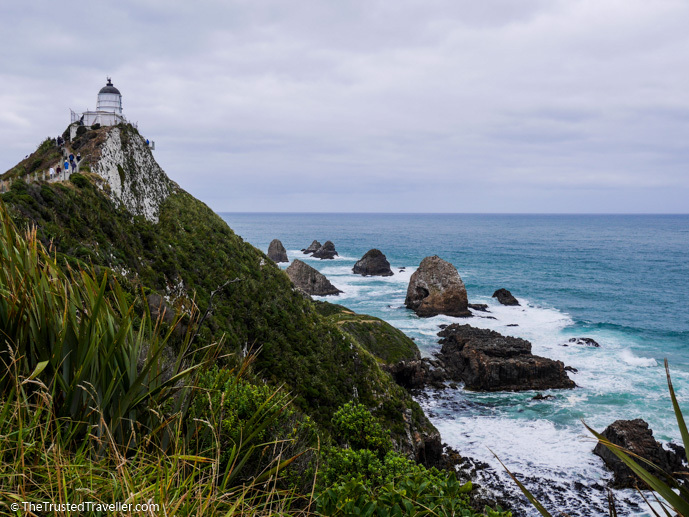 If you’re not visiting New Zealand for a specific seasonal reason, then the best time to visit, is October/November or March/April. This is because the weather is good and it is less crowded with other visitors and vacationing locals. 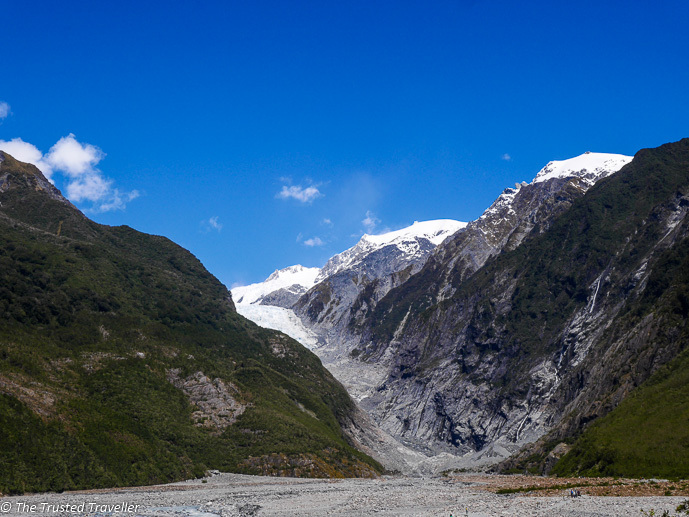 However, if it is winter sports that interest you, then you’ll want to head to the South Island from May to September when you’ll find plenty of snow. And over summer is when the country really comes alive with tons of great outdoor activities and festivals. If this is what you’re after, then visit from November to March. 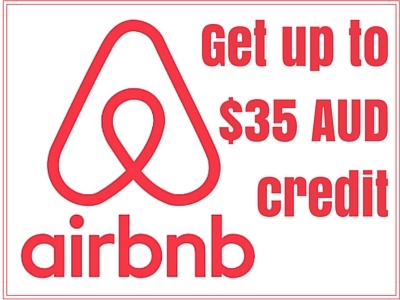 It is always recommend to have a mixture of cash and bank/credit card with you when you travel anywhere in the world and this is no exception in New Zealand. ATM’s are available in all cities and towns across the country and credit cards are accepted in most places too. The exception to this would be in some very small and remote towns where it is recommended to have plenty of cash on hand. Prices in the above table are in New Zealand dollars. To work out these costs in your own currency, we recommend XE.com. 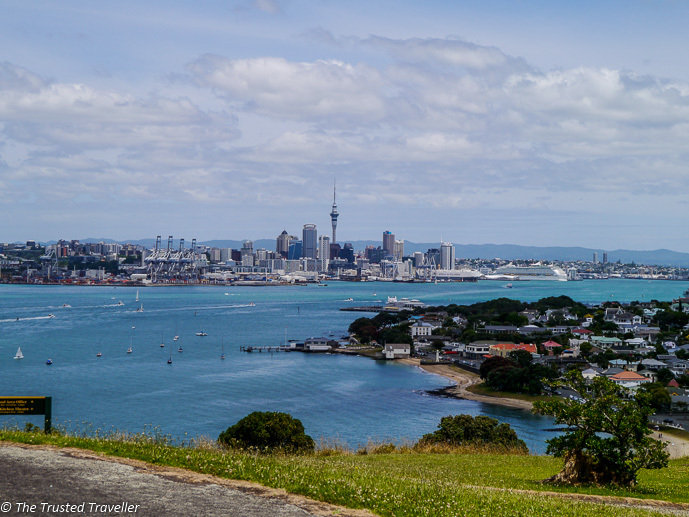 A selection of major and budget airlines fly direct to Auckland, and some to Wellington, Christchurch and Queenstown, from a few cities in Australia, the Pacific Islands, Asia, the Middle East and the US. If you are travelling from further afield, you’ll easily be able to find connecting flights through major hubs in Australia, Asia, the Middle East and east coast USA. Remember, New Zealand is a long way from most other parts of the world. It takes pretty much 24 hours (with a short stopover) to get from the UK and Europe, and 12+ hours from the US. Asia is a little closer with Singapore and Bangkok about 9-10 hours away. 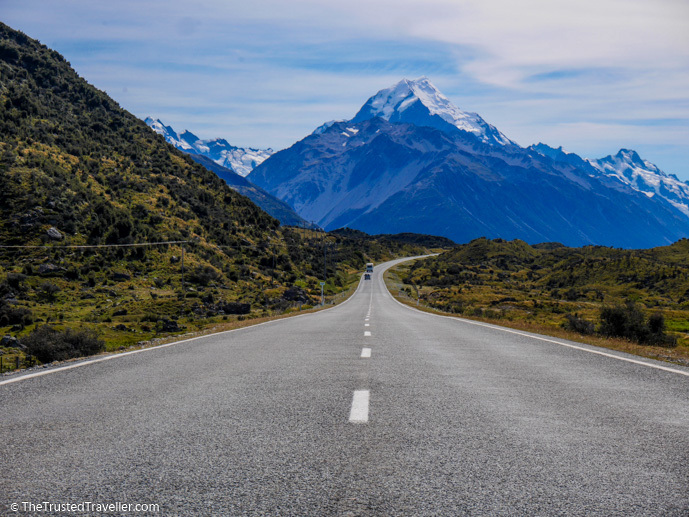 New Zealand is a relatively small country making it easy to get around, especially because of the excellent infrastructure they have in place. Air New Zealand is the country’s national airline and they fly between all the major cities and towns around the country including destinations popular with visitors like Auckland, Wellington, Dunedin, Christchurch, Queenstown and Nelson. The budget airline, Jetstar, also operates a smaller choice of flights between the above and more cities too. Because it is a small country, the longest flight time you’d encounter would be up to two hours flying between Auckland and towns in the far south of the South Island. New Zealand is an excellent place for a road trip. The roads are well maintained, routes scenic and you’ll often find that, in some parts of the country, you won’t come across another car for ages. All of the major car and camper van rental companies are represented in major cities and towns across the country, with outlets in all airports and some city centres. This makes it easy for collecting your vehicle at a time that is convenient to you. On the South Island especially, we’ve always found having a larger vehicle, like an SUV, more comfortable. 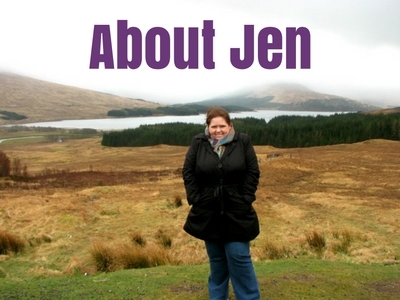 The island is very mountainous, so having a larger car has made us feel more safe and it also gives us lots of space to be comfortable for longer driving days. For those on a budget, buses are a great way to get around New Zealand and meet lots of like-minded people. InterCity – These guys cover pretty much every place a visitor might want to visit on both islands. InterCity services run more frequently then the other bus services in the country. Naked Bus – Similar to InterCity only Naked Bus generally has cheaper fares with one way fares starting from just $1. They follow much the same routes and might run a little less often. 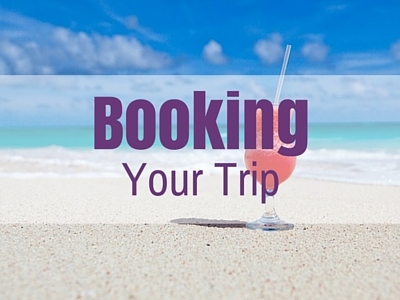 This is an excellent option for those on a really tight budget, who know where they want to go. KiwiExperience & Stray – These are hop-on-hop-off style buses geared towards backpackers. Passes can be purchased for an amount of trips or for a specific route around the one or both islands. You can hop off and stay however long you like before joining up with the bus again when it passes through town. New Zealand has only three rail lines all of which are more like scenic trains rather than a means to get form one destination to another. 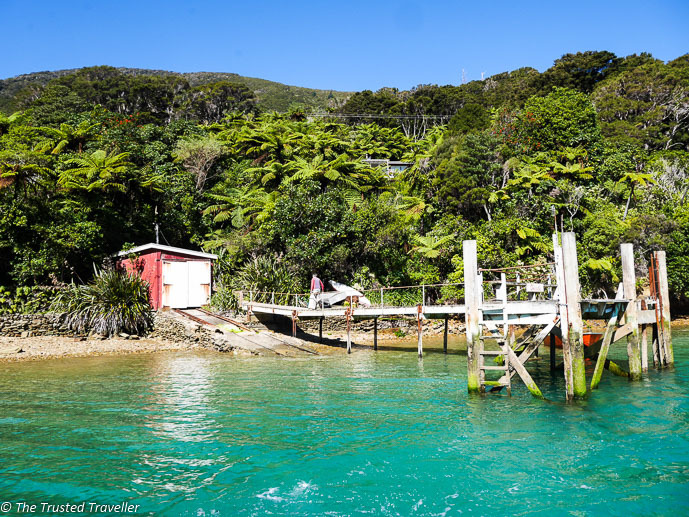 The Northern Explorer bisects the North Island running from Auckland to Wellington showing off the diverse countryside. The Coastal Pacific Train runs along the coast between Christchurch and Picton. It offers spectacular coastal, mountain and farmland views on the journey through this stunning part of the country. And finally the Tranz Alpine train cuts right through the centre of the South Island running between Christchurch and Greymouth. It is the most spectacular of the three journeys because it traverses the towering Alps. Check out KiwiRail for more details. Camping/Caravans/Cabins – Most National Parks have at least one campsite and every second or third town has a holiday park with campsites, caravans and cabins available. Free camping is also available in some areas. Hostels – Take your pick from the range of private and chain hostels located in major cities and popular towns around the country. Accommodation in hostels ranges from multi-bed dorm rooms to private single, double and family rooms, with or without shared facilities. 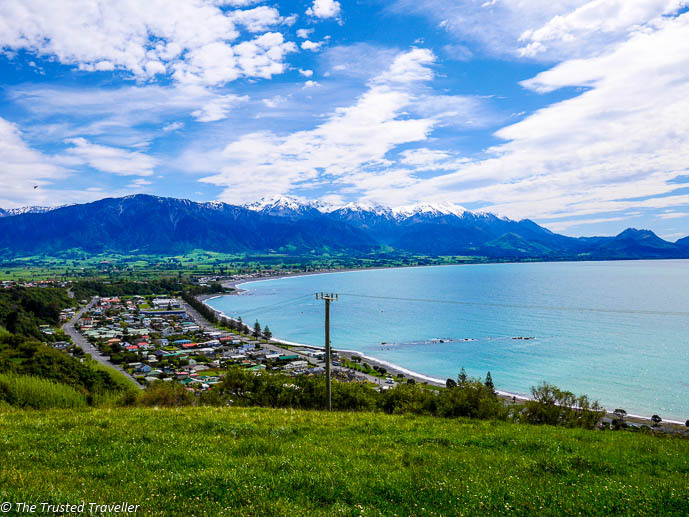 Budget Motels/Hotels – This type of accommodation is quite popular in New Zealand and you’ll find at least one or two budget motels/hotels in just about ever town in the country. Most will be clean and functional with private facilities and basic amenities. Hotels/Apartments – You’ll find chain style hotel brands the country’s bigger cities and towns. The good thing about this type of accommodation is in most cases you know what you are going to get, a clean, comfortable and modern room with a decent array of facilities in the room and on the property. Apartments are great for longer stays as they allow you a bit more space and the option to self cater. Luxury Hotels & Resorts – Every capital city and popular tourist area in New Zealand has its share of 5 star properties, some of which have been named in top lists of accommodation around the world. B&B’s – Small family run style accommodation like B&B’s can be found all over the country in small towns and popular rural locations. Accommodation is simple yet comfortable and the experience usually comes with friendly hosts and a home cooked breakfast each morning. Eating out in New Zealand can be expensive in comparison to some other regions of the world. There are ways around this, especially if you willing to stay in self catering accommodation and do some simple cooking from time to time. Supermarkets – New Zealand has quite a few supermarket brands. Countdown will be in every major town while you’ll find a Four Square in just about every town, big or small. New World and Pack’N Save are two more to lookout for because they generally offer cheaper prices. Fast Food / Take-away – Chain fast food stores are in all major centres of the country. If you’re looking for a cheap and tasty fast food meal, skip the chains like McDonalds and go for a local family owned hamburger or fish and chip shops instead. You’ll find at least one of this style of take-away store in every city and town of the country. Cafes – Cafes can vary greatly in price and quality depending on the city/town or area of a city/town. Meals range from simple sandwiches and salads to hot dishes made fresh or served from a food warmer. Cafes offer the chance to have a large hot meal at lunch time so in the night-time you’ll only need a snack. Pubs – Every city or town in New Zealand has a decent pub or two. A beer and a meal at a Kiwi pub is just part of the way of life in New Zealand. Pubs can vary widely in price these days as a lot in the major cities have been converted to trendy venues serving food that can rival some four start restaurants. However in country towns the meals are cheap and usually made using local produce. Restaurants – You’ll find a reasonably wide range of cuisines in restaurants across the country. Prices in restaurants can vary greatly depending on the location and quality of the food but there are some good cheap ones out there, you just need to dig a little deeper. Fine Dining – New Zealand is blessed with incredible local produce and this is showcased at it’s best in fine dining establishments across the country. 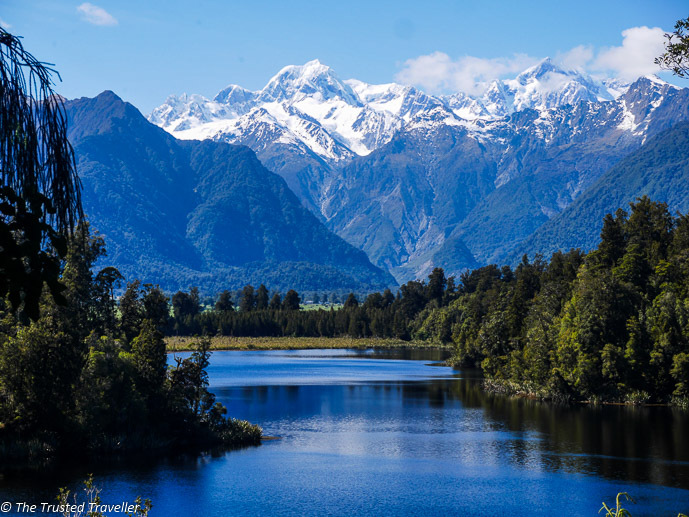 Here is a constantly growing collection of resources from around the web to help you plan you dream trip to New Zealand. 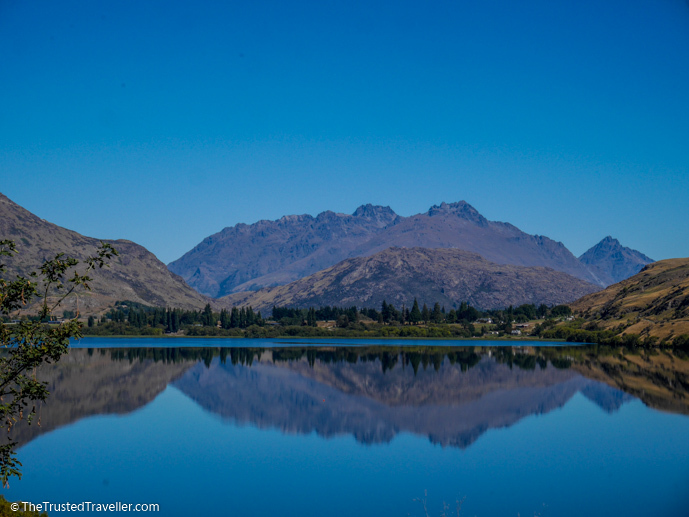 The official New Zealand Tourism website is a great place to start planning your trip. 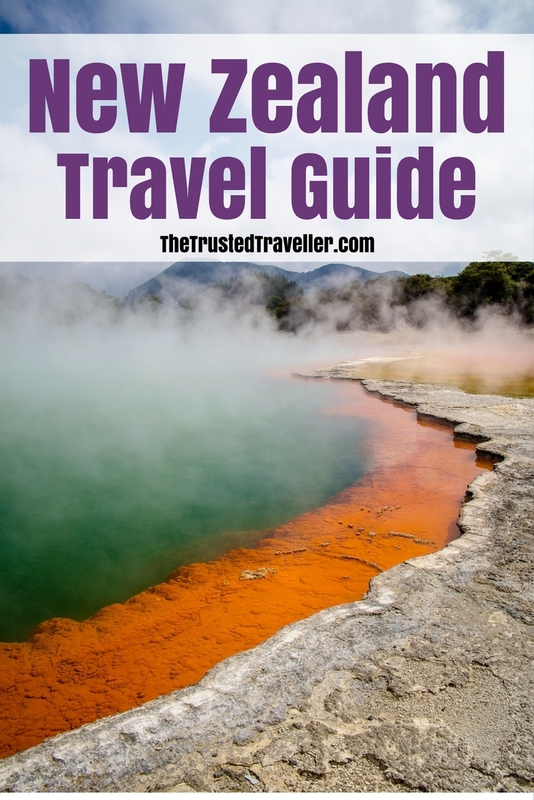 For a comprehensive guide to backpacking through New Zealand check out The Travelling Tom. 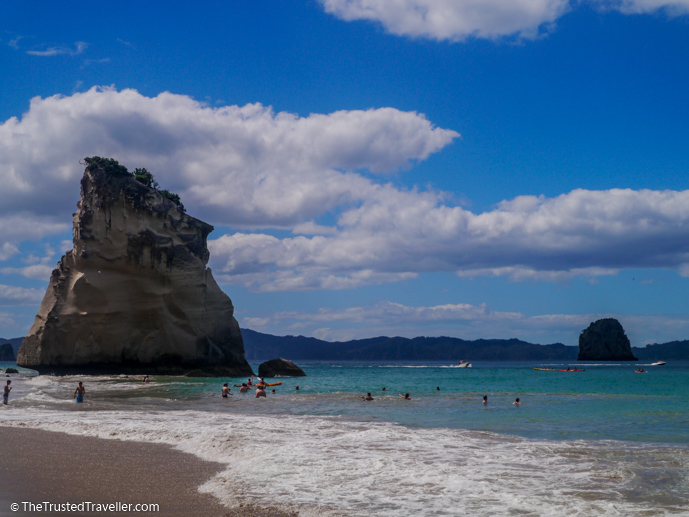 He’s written a bunch of great tips aimed at those looking to explore New Zealand’s beauty on a budget. The authority in all things travel, Lonely Planet has an extensive section all about Australia. Or why not buy the New Zealand Lonely Planet Guidebook in hard copy or as an eBook. 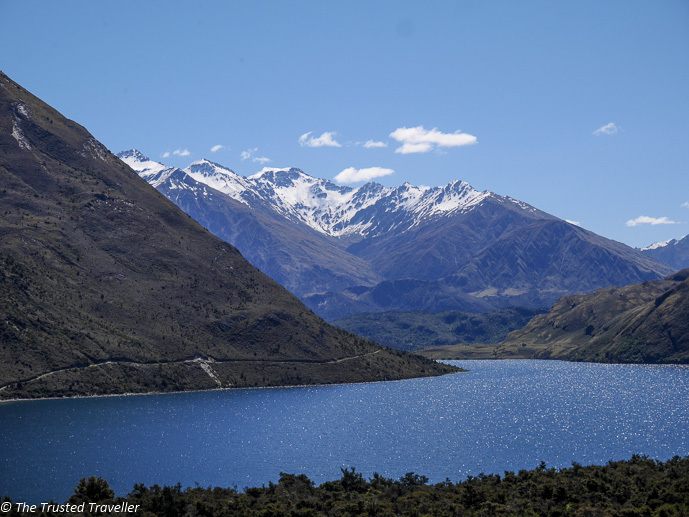 Check out this Ultimate Guide to New Zealand’s South Island. 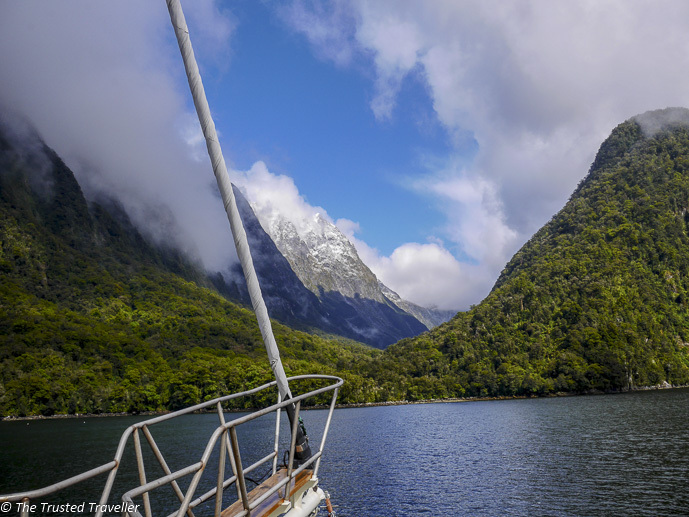 Lieselot from The World is a Circus lived in New Zealand for years and has written extensively about hiking, nature and cool spots in New Zealand. Sara Sees the World lives in Wellington, and while she travels all over the world, she also lovers to explore and write about her home country.